This building in southwest Grand Rapids, Michigan, was once the source of a large percentage of the world’s flypaper, where it was manufactured in 1885. 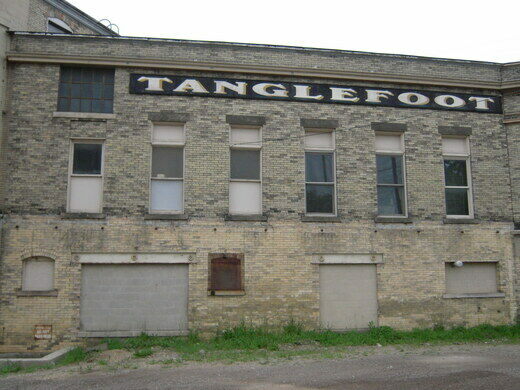 Tanglefoot, an insect controlling adhesive paste, is still manufactured and packaged here. The building is better known as the site of several artists’s studios and was an exhibit site for the city’s annual Artprize competition. Today, the majority of the space is used as the private working studio and galleries of both Michael Pfleghaar and Tommy Allen. Take Wealthy St. west of the Grand River, right turn on Straight Ave., building is on the right.